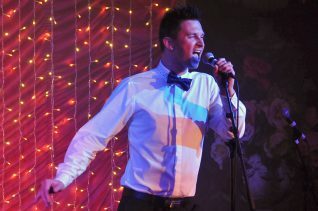 The Sussex Beacon’s Christmas Variety show ‘Tinsel & Tights’ brought a truly festive sparkle to Brighton. The fabulous David Raven a.k.a. 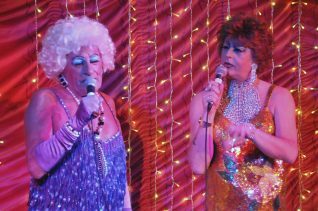 Maisie Trolette and Pooh La May hosted a night to remember with a glittering array of artists and a special one off EastEnders auction. 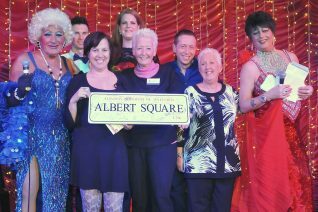 The auction raised an incredible total of £820 with the EastEnders Albert Square sign, autographed by the cast raising an incredible £500 alone. “I was literally holding my breath as the bidding battle went on and on “said Juley Ayres Fundraising and Communications Manager “I just could not believe the amount raised. It was a really fabulous night, and we are so grateful to all the fantastic artists who performed and continue to support us so loyally. 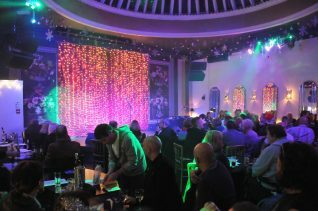 I can’t wait to tell the cast of East Enders just how much their donation raised for us”.